Wine School: How Much Sugar is in My Glass? I’ve never bought into making lofty New Year’s resolutions, but I do find the shift from one year to the next a good time to reflect on what I can do better, then execute. In 2019, I’m consuming less sugar. My kryptonite is gummy candy; I don’t drink much of anything with sugar. Or so I thought. 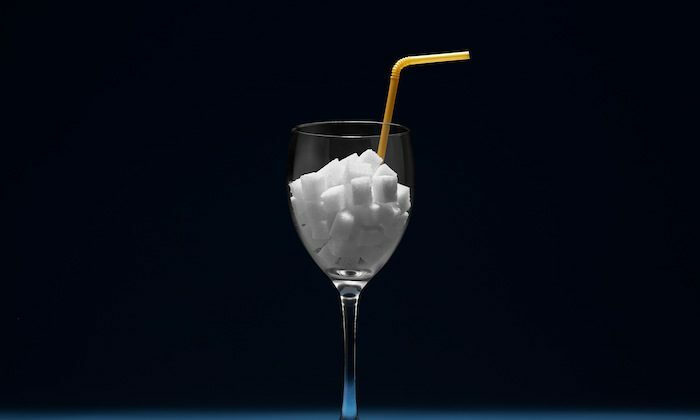 Wine, my favorite libation, can have quite a high sugar content. Very few wines have sugar added to them after fermentation to make them sweet; you’ll see that with many homemade or flavored wines, but that is not part of the conversation I am striking up with you today. I’m talking about going into my favorite wine shops, choosing straightforward bottles to pair with dinner, and understanding what I’m buying—and if I need to skip dessert. The sugar left in wine after it’s fermented is called residual sugar. The facts around it can be confusing, as it depends on a number of factors. Furthermore, characteristics within a singular wine can work with or against the sugar content to elevate or diminish it on the palate, meaning you can’t just trust your tastebuds. Wine lovers determined to monitor sugar intake, this one’s for you. The Grape: The primary factor affecting the sugar content of a wine is the sugar content of the grapes used to make it. Some grapes are naturally higher in sugar than others. Among white grapes, for example, Muscat grapes are considered high in sugar while Chardonnay grapes are low. The Harvest: The next big factor affecting wine’s sugar content is how late in the season the grapes were harvested. The longer they stay on the vine, the more concentrated the sugars become. This is evident when looking at the classification of German Riesling wines, harvested at different times during the season, then classified according to sweetness. That last harvest—often after frost has set in—is most certainly destined for a dessert wine. Fermentation: In addition to varying amounts of sugar, grapes also contain varying amounts of yeast. In winemaking, grapes go into a vat and get pressed. The grapes brought in for winemaking are usually teeming with wild yeast that go to work on the juice right away, starting an all-important micro-war: As the yeast begins to feed on the sugars in the grape juice, the sugar is converted to alcohol and carbon dioxide. Once the wine’s alcohol levels are high enough, the alcohol then kills the yeast. The winemaker can also stop the fermentation early with cold shock, pasteurization, or adding additional alcohol, as is the case with fortified wines. The measure of residual sugar is often to referred to as Brix, measured in grams per liter. Wine with a higher Brix has more residual sugar than a wine with a low Brix, also known as a “dry wine,” but it may not taste sweeter. Other factors—acidity, tannin, alcohol content, and body—also contribute to the overall sweetness you perceive, and how palatable you may find the wine. The right combination results in a wine with great balance, regardless of residual sugar content. Acid: A sweeter wine that is also acidic will feel more balanced than one with low acidity. Acid lowers perceived sweetness. Tannin: Tannins also mask sweetness because they dry the mouth out, so the perception is that the wine is drier. Alcohol: Alcohol is interpreted on the palate by many different receptors, and genetics actually play a role in how bitter or sweet it tastes. But in general, as previously discussed, a wine that ferments to a high alcohol level had the sugars to do so, and will almost certainly have low residual sugar content and be dry. At the same time, high alcohol content is also associated with body and oiliness, which is reminiscent of sweetness on the palate. Body: Wines with a high Brix tend to be more viscous, adding to the mouthfeel, which is desirable for some. All four characteristics of sweetness, acidity, tannin, and alcohol contribute to the body. I haven’t delved too far into the world of wines marketed as low sugar, and I’ve tried none of the mysterious ketogenic wines out there, but I did taste the line up at FitVine, a company that ferments to dry and uses no flavor additives. Their proprietary process extracts more color and tannins, and they also further filter all wines so they’re gluten-free and have less sulfites. But most importantly, the wines are balanced, flavorful, and satisfying. Look, health is great, but my wine has to taste good, too. FitVine Pinot Noir ($19.99): Black cherries, cedar, and honey on the nose with a round mouthfeel. Smooth and well balanced. FitVine Chardonnay ($15.99): Pear, lemon, and vanilla on the nose. Full body and a long, crisp finish. Finished in stainless steel instead of oak, so very clean. FitVine Prosecco ($19.99): Fruity tropical flowers and ripe pear on the nose. Palate has nice minerality, green apple, and citrus. Finishes with crisp acidity. Cinnamon can lower blood sugar following meals, possibly by slowing stomach emptying and blocking digestive enzymes.